Gold was treading water on Friday exchanging hands for $1,330 in afternoon trade in New York. Gold is coming off two-year highs hit early this month and year to date the metal is still up more than 25% or $270 an ounce. gold price topped $2,000 an ounce has sparked fresh investment in the sector with a new report forecasting steady production growth through 2020. 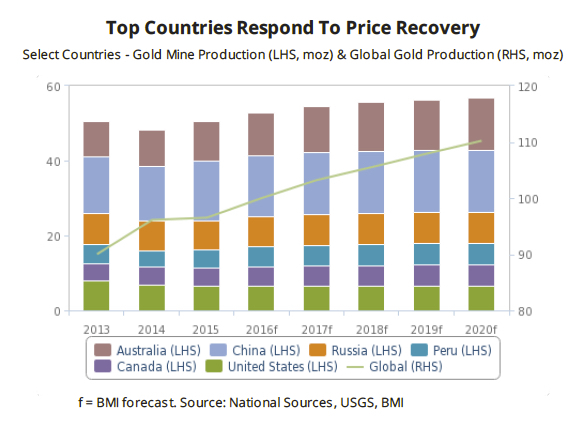 BMI Research, a division of Fitch, predicts in a new report that gold miners will add 10 million ounces or more than 280 tonnes to global production with average annual growth of 2.7% for a total of 110 million ounces or 3,118 tonnes yearly output by 2020. This represents a slight deceleration in growth rate compared the previous five-year average of 3.2%. Projects expected to add substantial ounces to global gold production before the end of the decade include Endeavour Mining’s Hounde project in Burkina Faso, Goldcorp and Teck’s Corridor JV in Chile and Torex Gold Resources giant El-Limon-Guajes ramp up to full production. Beyond 2020, Continental Gold’s Buritica project, Phase 2 at Rio Tinto’s Oyu Tolgoi mine in Mongolia and Barrick’s Goldrush in the US would further boost production. BMI is bullish on the outlook for gold prices, saying that gold prices bottomed in 2015 and will edge higher over the coming quarters. The firm forecasts an average of $1,300 per ounce in 2016 increasing to $1,500 by 2020. Gold averaged $1,160 last year. 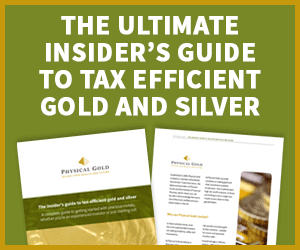 This entry was posted in Industry News and tagged Mining & Supply, Physical Gold.